Where can I find more information about permafrost? Where can I find information about frozen ground and frost depth in my area of the world? I have a question about permafrost that wasn't answered on this site. Who can I contact for more information? Active Layer at the Soil Surface: U.S. Fish and Wildlife Service. An animation of how the active layer freezes and thaws every year. International Polar Year (IPY) Land and Permafrost: Explore permafrost in detail on this Web site, which is aimed at high school and college students. U.S. Fish and Wildlife Service: Ice Wedges, Polygons, and Pingos: Learn how permafrost features form. NASA Earth Observatory: Permafrost on Mars and Earth: Learn about permafrost that NASA scientists found on Mars. Wiley Interscience Periglacial Ice Wedges Animation: See how ice forms in cracks in the ground. The Trans-Alaska Pipeline: Learn more about the 800-mile-long Trans-Alaska Pipeline System. Arctic Coastal Plain Ecosystems: Learn about the Arctic coastal plain on this Web site produced by Houghton Mifflin Harcourt school publishers. Arctic National Wildlife Refuge Web site: Learn about the unique environment of the Arctic National Wildlife Refuge. Canada's Polar Environments: This Web site, produced by the University of Guelph and CyberNatural software, explores the unique oceans, lands, freshwater, and atmosphere of the Canadian Arctic. 77 Degrees South: This Web journal describes a research expedition that explored Antarctic permafrost. University of Alaska Fairbanks (UAF) Geophysical Institute Permafrost Laboratory: Read about the variety of permafrost research projects at UAF's Geophysical Institute. Permafrost and ground ice in Google Earth: NSIDC data on virtual globes includes permafrost data from the Circum-Arctic Map of Permafrost and Ground-Ice Conditions. Scroll down to find the permafrost data as a KML file. Impacts of a Warming Arctic: Arctic Climate Impact Assessment. A comprehensive report on how climate change is affecting the Arctic. Observations: Changes in Snow, Ice, and Frozen Ground (PDF, 8.38MB): Intergovernmental Panel on Climate Change. This section of the IPCC's Fourth Assessment Report summarizes the latest scientific understanding of changes in snow, ice, and frozen ground as indicators of climate change. Permafrost and the Changing Arctic: Earth Science System Educational Alliance (ESSEA). Study how permafrost is changing as climate change affects the Arctic. UAF Permafrost Laboratory Image Gallery: Find photos of Alaskan permafrost from the University of Alaska Fairbanks. Alaska's Digital Archives: Find photos of Alaska scenery. Frozen Soils and the Climate System: NASA Earth Observatory. Read about how scientists study interactions between frozen soils and the climate system. Melting Beneath Our Feet: Arctic Science Journeys Radio. Doug Schneider, of the Alaska SeaGrant Program, talks with deputy executive director of the U.S. Arctic Research Commission, Lawson Brigham, about the importance of permafrost in Alaska. Scientist Measures an Overlooked Greenhouse Gas: National Public Radio's Melissa Block interviews Katy Walters, a permafrost scientist at the University of Alaska, Fairbanks. Soil freezing gets a warm reception here: Seattle Daily Journal of Commerce. Engineer James Miller writes about a soil-freezing method that aids in construction in Washington State. Figure 1. 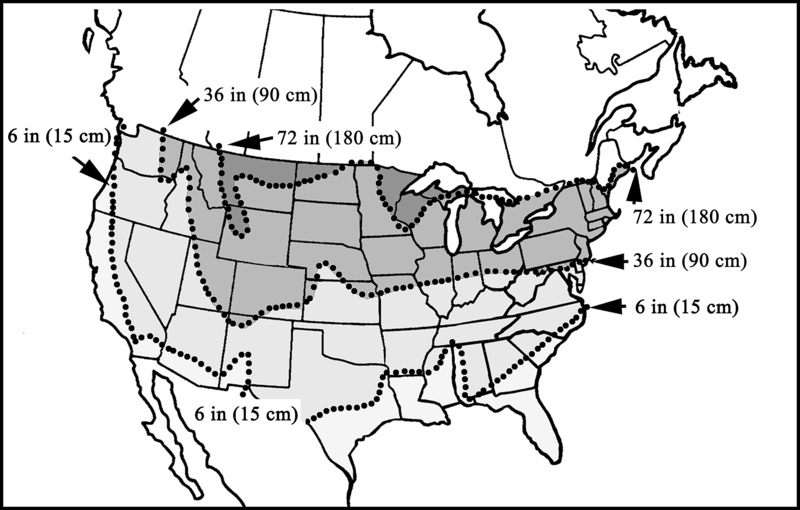 Most frozen ground in the United States is seasonally frozen ground. The shaded areas on the map, between the dotted lines, mark the average depth that the soil freezes to in the winter. 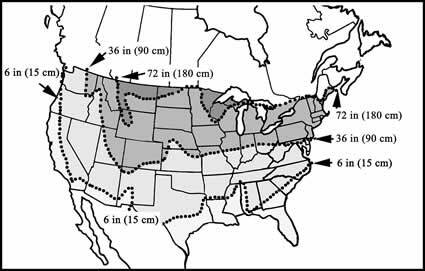 The map on the right shows the average frost depth in the contiguous United States. For detailed information about frost depth in your area, contact your local government. For more information or questions for NSIDC scientists, please contact NSIDC User Services at nsidc@nsidc.org or +1 303.492.6199.